Tickets for Hearts’ Betfred Cup Semi Final against Celtic at BT Murrayfield are now on general sale. The match kicks off at 1.30pm on Sunday 28th October. The club was allocated 30,000 tickets for the fixture, which went on sale to season ticket holders on the 11th October, giving them a week to take up their allocation. To date, 18,000 tickets have already been snapped up. 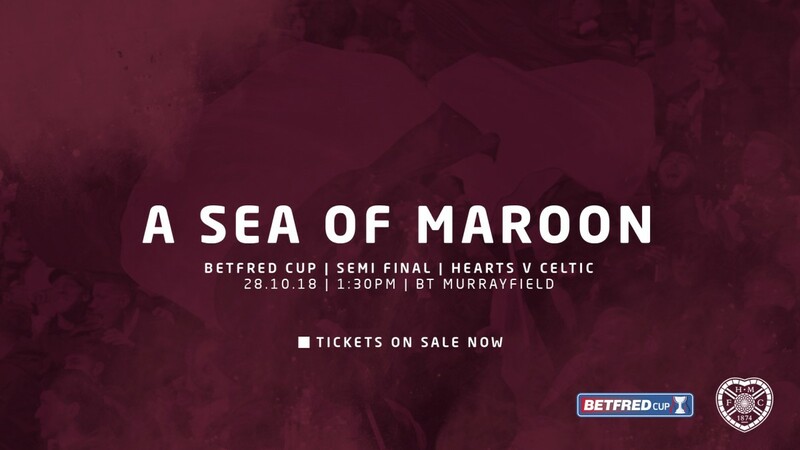 A massive thank you to all who have purchased tickets to join the ‘sea of maroon' and support the team at Murrayfield. The club pushed hard to have the original arrangements for the game changed, to allow as many as possible to be at our first semi-final for 5 years and make it a truly special occasion for Jambos of all ages. In order to support this and encourage groups of families and friends to enjoy the game together we are now able to offer 4 tickets per account in the general sale. If you have larger groups then please contact the ticket office who will do their best to help. Supporters who registered an account with Hearts either via the Ticket Office or on the eTicket's website on, or prior to, the 26th of September 2018 will be eligible to purchase tickets. Season ticket holders who have purchased tickets already will, of course, also be able to buy additional tickets (to a maximum of 4 in total). Please remember that our ticket allocation is for Hearts supporters. Please also remember that the purchaser is responsible for the behaviour of the ticket holder.